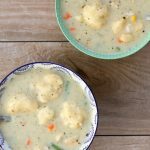 Today is Day 12 of 31 Days of Instant Pot recipes! If you’d like to receive all the recipes sent straight to your email you can sign up here. 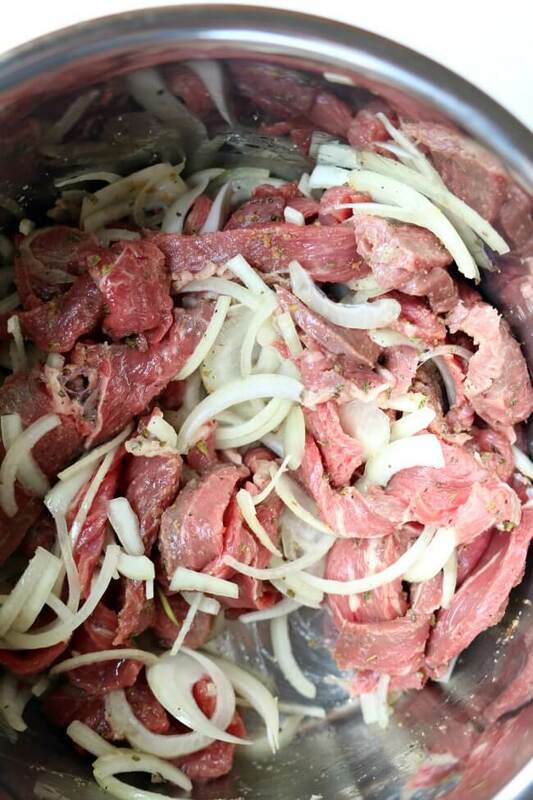 One of my favorite and most popular slow cooker recipes is beef gyros. I wanted to see how the beef would turn out in the Instant Pot. The results were very favorable! First off, I used a roast that I bought at the grocery store and it was packaged as a “cross rib roast.” I find that the best results come from using a “cross rib roast” or a “chuck roast.” I bought a rump roast once and I didn’t think it tasted near as good and it wasn’t as tender. I went ahead and sliced the meat very thinly. Probably about a quarter inch thick. You can see that there is a bit of marbling and connective tissue in the meat. That will help with the tenderness. The collagen turns to gelatin and makes the meat fork tender. I went ahead and added in onions, garlic, oregano, lemon juice and bit of oil and then gave it a quick stir. Finally I added in just 1/3 cup of broth and then set the manual timer for 25 minutes. I have been reading a lot about how to get the best results with meat in the Instant Pot and what I’ve found out is that it’s best for the pressure of the pot to release naturally. This means when the pot beeps it’s not done yet! Let the pressure release for about 15 minutes and then open the pot. This will keep the meat much more juicy. The results were fantastic. 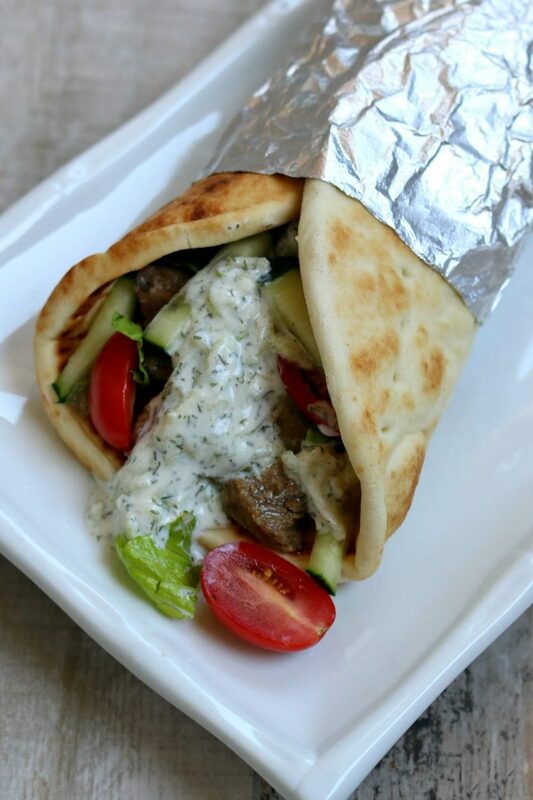 Extremely tender meat that is ready to be enveloped by a soft pita and topped with a cucumber yogurt sauce. To make Instant Pot Beef Gyros I used my 6 quart Instant Pot Duo 60 7 in 1*. I love this Instant Pot because it has the yogurt making function which I use almost weekly. It has two pressure settings (high and low), and there are also little slots in the handles so that you can rest the lid there instead of putting it down on your counter-top. Like this recipe for Instant Pot Beef Gyros? If you’d like to see all the new recipes that I’m making sign up to receive my emails below! This is a free service and you can unsubscribe at any time. 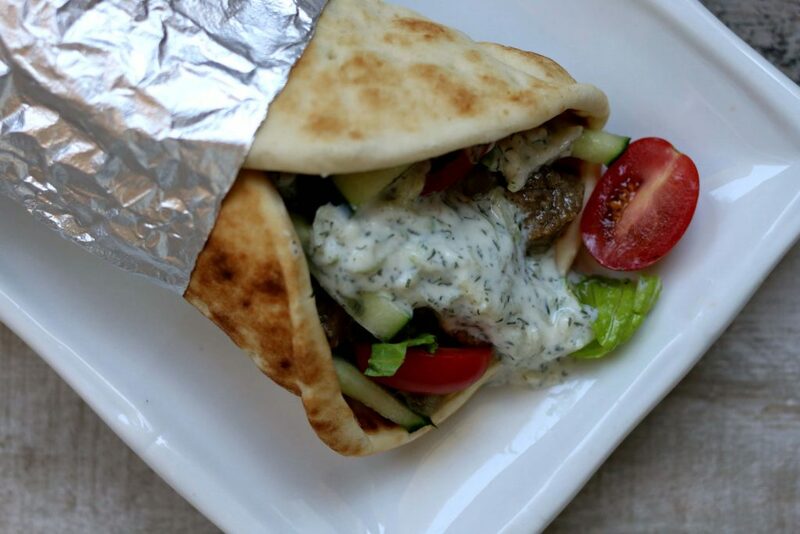 Serve beef over pita folds with Tzatziki sauce, onions, tomatoes, lettuce and feta. My Instant Pot took 10 minutes to come to pressure, then 25 minutes of cooking time plus 15 minutes of releasing the pressure. So the total time in the pot was 50 minutes. The tzatziki sauce? Um I don’t know how well that would freeze. It’d dairy plus it’s got the cucumber in it so I think it would be separated and watery if you tried to freeze it. I’m sorry! Hello, I bought premade Gyro meat that is already cooked. Should I change the cooking time? I’m not exactly sure but I would try 4 minutes. Used Naan instead of pita 🙂 delicious recipe will absolutely make again! I am making this now but am confused as to how long I should have set the timer for. Recipe says 25 min high pressure but so many of the reviews comment on cooking for 30 min. Which is it? 25. The recipe has been corrected from a previous version. These were fantastic. Not quite a gyro for us, but definitely delish. We followed the recipe as is. We did run into a little quirk though with your TZATZIKI. Greek yogurt was by far to thick and didn’t take quite right. We ended up adding about a teaspoon of lemon juice to help thin it out. Next time we will try your recipe with just plan yogurt and not use greek. What’s your secret to slicing the roast so thin? I do it when it is partially frozen. Throw the roast in the freezer for 15 minutes and then slice it. Made this as my first IP recipe it was so good. I will difanitaly make it again. Would you have nutritional information for the Gyros that you could share with me? Hi Cindy, I just added in the nutrition info for the meat. If you eat it on a pita you’ll have to add that in as well as the tzatziki sauce. Made this in my six quart Instant Pot. The only changes I made were to use diced garlic instead of garlic salt and added just a bit more beef stock. Turned out delicious! Even finicky kids loved it. Loved the chicken gyros so much I was going to substitute & try with beef. I am so glad I checked for a beef gyro recipe ~ delish!! I used a (2″ thick) beef chuck BLADE steak, that I thought was a ‘chuck roast’ when I bought it. I was worried that cut might be tough in the pressure cooker so I tenderized it first then sliced thin per your instructions. I added an additional 1/4 water as I was worried there wouldn’t be enough liquid – I did not need the extra liquid. It was delicious and very tender! I used full fat yogurt this time and agree with you~ the taste is worth using it. I live in a small town and only Walmart carries Greek style pitas – their brand was the only choice however lucked out ~ very soft and taste-y. I’ll try your recipe link for pitas one day when I am feeling more adventurous. Thanks for another fabulous recipe!! I am officially stuck on making gyros at home! Also, which seasoning profile do you think would be best with pork ~ the chicken or the beef? Thanks! This tasted very good but was nothing like Gyros. I cooked for 30 minutes and it was so tender it disintegrated. I ended up serving it over rice. Made this today as stated in the recipe adding only a few grinds of medeteranian spice. I saved the liquid to make gravy for another meal. My thought is that a tablespoon of dry dill is too much did you mean a teaspoon? I the insta-pot now. Just realized I halved the meat but not the other ingredients and set for 30 mins. Will post again to see what happens. At the 30 min mark, with a brief wait, my son opened it in anticipation and found some still slightly pink. He still ate it, said it needed to be more tender. Closed the pot and left on for a bit more. Overall, recipe is a keeper, flavor is great, just need to tweak the time. Is there a way to make it more tender after you open it? This recipe turned out great! My boyfriend wasn’t sure about the sauce at first but ended up liking it. Though he said it’s not something he would eat regularly as it’s an unique food. I thought it was great! If I want to double the amount of meat…do I need to double the other ingredients? I did that! I did adjust the other ingredients up a bit to our taste. It turned out fantastic! Thanks! When you doubled the recipe how long did you cook it for? I used the same amount of time Kerri. I made the meat with all the ingredients, including the liquids and put in a vacuum bag overnight, 1)it gave the meat a lot of flavor,I just poured the contents in the bag into my insta pot, set it for 30 and wa-la ! I was afraid to look at first cause I see a few that said the meat burnt?? Not sure why cause I had a lot of juice in the pot when it was finished cooking?? Tried this tonight. It was not what I was expecting. Turned out like a pot roast in a pita bread with cucumber sauce. Wasnt horrible but was the first time I ever put pot roast on a pita. I will tey the same recipe with a few tweaks with lamb meat. Like Insaid before, wasnt what I was expecting, but still wasnt a bad meal. I am confused, is this soup? How is it meant to go on a pita without completely soaking it? In no way shape or form would I have compared this to gyros, it doesn’t taste the same, isn’t the same texture, and gyros meat is never boiled… There are just some things that don’t belong in a pressure cooker, and gyros are definitely on that list. Another review had compared it to pot roast and that review was dead on. Completely agree with Derick. It’s just not a gyros without the lamb Good roast beef with tziki sauce. I subbed LF sour cream instead of Greek yogurt. Made this tonight for dinner. It was scrumptious! Followed the recipe exactly, will definitely make again. Whole family loved it. Sorry if I seem ignorant to how the pressure cooker works, but I just got an instant pot mini (3qt) do I need to reduce quantities in this recipe for that unit. This recipe will fit fine in the 3 quart. Tasty overall! I also ended up with a lot of liquid when it was done. I might try sautéing the meat in the InstantPot before switching to pressure cooking, and instead of adding water, I might just add a pouch of beef oxo powder for flavor but leave it at that. We loved it and think it has potential once we get the liquid down. Tzatziki was bang on though! I had 3 pounds of chuck roast, cooked it for 30 minutes, let it release, and it was burnt to a crisp. So sad. What? I’m so sorry! I’m not sure why it was burnt. Was there liquid in the pot? Thank you so much for this recipe! It was fantastic- even my kids devoured it! I couldn’t find great pita, so I used Naan that I put on my griddle top for a couple minutes with a little butter. The whole thing was amazing and I’ll definitely be making it again!! Oh that sounds good. I love naan! Thank you to everyone who posted their experiences! Based on this advice, i added: 2 gloves garlic, minced; 1/4 t cumin; 1 t salt (up a 1/2 t); 1 t smoked paprika; omitted the garlic salt; beef broth instead of water; and let it sit one hour before starting the IP. It was delicious, and we can walk to Chicago’s greektown from our house! I love that i know what went into my meal, and that i even know the farmer who raised the beef (we have a beef CSA). So much better and now we won’t feel yucky tomorrow from all the stuff we don’t know about! Thank you! Thank you so much for your thoughts on this recipe. It sounds amazing and I will take your advice and make it like this the next time I make it. Thank you for the tip and including the amounts. Going to try it this week with the added spices. We love the smoked paprika! Not great. The amount of liquid in this recipe was ridiculously low and even after doubling the liquid it still burned before those 30 minutes were up. Why would anyone use water when they could use stock? At 24 minutes, I thought my 1-1/2 lb roast meat was a little dry and overdone. Having tried other gyro recipes with more authentic ingredients ie lamb, I was pretty disappointed that it didn’t really taste like gyro meat. Should’ve known better. I made my own pocketless pitas, which saved the recipe along with my own homemade Tzatziki. I won’t make this again, at least not like this. Sorry author! 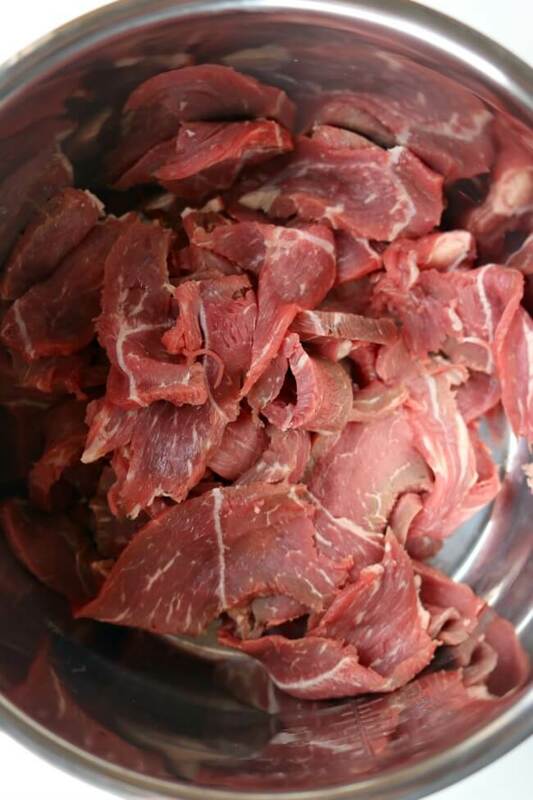 when you cut your beef, is partially frozen or is there a better way to cut beef into thin slices? I love cutting it when it is partially frozen. It makes it so easy. This is a good recipe! I’d suggest going a little heavier on the seasoning, and adding a little cumin and paprika for more of a gyro taste. The liquid from the onions and lemon, plus about a tbsp of apple cider vinegar, and a few tbsp of water were plenty of liquid for me. I also cut the cooking time to 12 minutes, let it NPR for 10 and then did a QR, and left it on sautee of a few more minutes to dry up the liquid….that didn’t turn out exactly how I wanted though, and I wound up having to drain a bit of the liquid off, add a little more olive oil, and sautee the meat to give it a little brown. It turned out delicious! like “gyro” meat, use Cavendar’s Greek Seasoning. Walmart carries it…at least the ones in my area do. Rating this 4 stars for effort! Was very good! Use Greek seasoning in place of spices, can be found in high end grocery stores and is around $2. Very cheap. Tazaki is best if prepared first and sit’s in the fridge, while you prepare the rest, the longer it sits the better it gets! I have been making it for years and is a family favorite. I have another recipe I use for tacos, replace dill with cilantro, lemons with lime juice, leave out cucumber and add cumin. Yum! Thanks Kelly! I like your ideas. I love me some tzatziki and will have to let it sit longer next time. 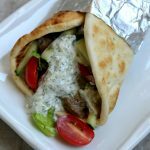 As a fellow gyro lover, I love the concept of this recipe but made a few changes! First, I love my Instant Pot but usually when I cook meat it turns out bland, and tasteless due to the amount of liquid you have to add. This meat turned out the same way so I pan fried it after it was done cooking, and it was 100X better. Overall, a good recipe just needed some tweaks! Made this today, with fresh garlic too. 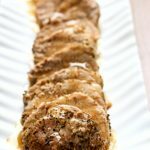 OMG so simple and great taste, used a 3lb roast and I’m so glad, yummmmm. This is absolutely our FAVORITE instant pot recipe. The whole family loves it! I never have leftovers! So glad to hear this! Thanks so much Jennie. So incredibly good! Husband went nuts! Thank you for this recipe. My husband loves it too! Win!!! 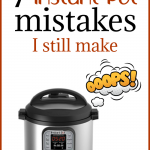 What if you don’t have an “instant pot” just a regular electric pressure cooker? Would you use high pressure or low pressure? This was bland on the day that I cooked it. I had a lot of liquid when finished. It was tender. Maybe it will he better after sitting overnight and flavors blending better. Getting ready to make this tonight, stupid question. Does the recipe call for 1/2 pound chuck roast, or one and a half pound chuck roast? My wife and I interpreted this differently, and I would think the larger amount would work better, based on the last comment, seems like the right way to go. Thanks in advance! one and one half pounds! I need to figure out how to write that out better don’t I? 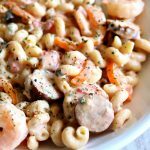 I made this recipe last night and it was great! I followed your instructions as directed, using a Wolfgang Puck electric pressure cooker that has no settings to adjust the heat so the meat was cooked on high. I didn’t open the cooker for at last 30 minutes after cooking as I was busy doing other things. The meat came out tender and flavorful. I used a chuck roast that weighed about 2 pounds. I read that other readers did have large amounts of liquid left in their cooker. I had less than a cup of liquid in the pot when my meat finished cooking. Adding only 1/3rd cup of water and the 2 TB of lemon juice seems to be the perfect amount to add before sealing the cooker. Any leftover juices can be frozen to use in a soup or stew recipe later in the month. Thanks for posting this recipe. I feel fortunate to have found it and will be making this again for my family. Thanks Karen, this is my first time reading your blog. 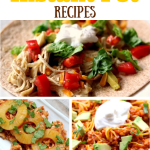 Love the recipes and added information. I will be trying this recipe for sure. I told my husband last night that I am in love (with my instant pot) 😜 thanks for sharing. (1) what button to use? (2) what pressure – high or low? (4) Quick Release or Natural Release? I must have done something wrong. I added the 1/3 cup of water and then put it in the Instant Pot on manual for 30 minutes on high pressure. Once it was done I left it for 15 minutes NPR but I ended up with close to 4 cups of water in the pot and a large amount of the meat had all but disintegrated. All in all, I think I’ll will try to make it again as I think this recipe has a lot going for it. hmmm, that’s weird. what kind of meat did you use? This was really good. I like a bolder flavor so I used beef stock(instead of water), some seasoning salt, and about a half pack of dry beef/onion soup mix in with the other recipe ingredients. Let in marinate for about an hour. 25 minutes with a Power XL. Chris, I like your ideas! Sounds so good! Made this tonight and the family gobbled it up. I personally thought the meat could have had a bit more flavor – in saying that the meat ended up in so much liquid that I had to strain it and probably lost flavor that way. Used chuck steak and it was def the right cut to use! Will make again, not add water and add fresh garlic and more herbs! Thanks! Thanks Tanya for letting me know! I’ll try without the water as well. I was under the impression that the ip needed that liquid to come to pressure. Am I wrong? Instructions were clear and pictures were great, but if you’re expecting the meat to taste like gyro meat like I did, you’ll be disappointed. I found it really bland and not like gyro meat at all. So disappointed because the ingredients were pretty expensive. I’m sorry you had a bad experience! I really like this recipe. Maybe next time bump up the seasonings. This looks fabulous! Perfect for an “at-home casual date night” with my hubby. He loves gyros. Perfect to enjoy while watching a movie. Of the two — chicken of beef — which of your Gyro recipes do you like best? I noticed in the chicken version that minced garlic is used versus this recipe which calls for garlic powder. Also, no allspice or lemon pepper seasoning in the beef recipe. May I ask the reason why? I’m going to give gyros a go with venison, but am debating which recipe to run with… Questions aside, thank you for sharing! I like them both! But beef is probably a little more flavorful just because it’s beef. You can’t go wrong with either recipe. Let me know how the venison works. 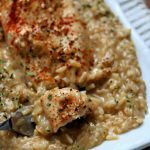 Are you going to cook it in your Instant Pot? Is this on High or Low Pressure? I’m new to the IP. Do I do a quick release when the timer goes of after 30 mins or do the release after waiting another 15? Release after waiting another 15. That way the meat won’t get zapped of its moisture. How long and what temperature would you recommend in a regular crock pot? Help please I have a power cooker plus. How do I convert the manual button to my cooker? Hi Kellie, I’m not totally familiar with the power cooker plus but I’m assuming you could just use the meat/chicken button. Good luck! I have 2 lbs of beef chuck roast. Do you think 30 min will still work? Or should I up the time? I don’t want to over cook! I’d probably do about 25 minutes! 1-1/2 lbs????? I like your recipe ideas, but I don’t trust any of them, bc you always have a lot errors, corrections. Perfect the recipes FIRST!! I would have just added about 3 mind on just a 1/2 pound me personally Hope this helps..
I’m totally not sure but I don’t think it would work. London broil cooks really quickly on the grill and I don’t think it would benefit from the pressure cooker/slow cooker moist heat cooking method. I just made Mongolian beef with London Broil in the pressure cooker and it was delicious. It was only cooked for a few minutes though. I was thinking about trying this recipe with LB but maybe marinating the meat first and only cooking it for 5 minutes on high. ok this is so good to know Pam! Thanks so much. I think if it worked for the Mongolian then it should work for this one. Let me know how it goes and how many minutes you cook for! So, no browning of the meat? I missed the water as it wasn’t in the directions 🙁 just went back and see it’s in the ingredients but not in directions. I only have 4 mins cook time left. Is all that beef going to go to waste? Should I add water now and re cook for another 30?! It should be fine! I’m sorry about that error on my part. I just went and fixed it. Hopefully it was okay for you! This sounds so good! Do I slice the beef with the grain or across it? I Mean do we cut it long ways or short? I would think Long then cut down to size? I totally forgot to add the 1/3 cup water (listed in the ingredients but not the directions) but mine turned out fantastic! My husband said it was the best gyro he’d eaten. Definitely putting this in regular rotation, just blown away by how tender it was. Thanks! HOOOOOORAY!!!! so nice to hear this. Thanks Rebecca! Tried this tonight and it was REALLY good! My family loved it! Thank you! Trish, this is so nice to hear. I’m glad that your family loved it! I plan to make this–it sounds delicious. The recipe calls for diced cucumber shredded. Which is it? I have never had this so I do not know how to interpret. Thanks. oops that is a typo. It should be one cup of diced or shredded cucumber that has been seeded. I like to dice mine up really finely. How long would you recommend cooking in a crock pot? Would you need to add some broth/liquid? Erin, there is a link at the top of the page that says “click here for the slow cooker version.” If you go there it will give you the exact instructions for cooking in the slow cooker! Good luck! I wanted to subscribe but the page was so hard to read that I changed my mind. Why does everybody use this pastel print? It makes it so hard to read especially when you are older (like me) and the eyes are not so good any more. I love to get the recipes but …..
I’m sorry. I will get with my designer and see if she can fix this. Thanks for the suggestion. Where would I find the cucumber yogurt suace? By the dips and refrigerated dressings. I made mine using Greek yogurt and Hidden Valley Ranch cucumber dill dry seasoning mix. It was very good!